Chessdom informs the World Championship match between Anna Ushenina and Hou Yifan will be organized by the FIDE and Chinese Chess Association from September 10th-27th in Taizhou, China. The match will consist of ten classical games with the time control of (90'+30')+30''/per move. If necessary the tie-break will also be played: there will be four tie-break games 25+10 with a new drawing of colors if the score will be even. 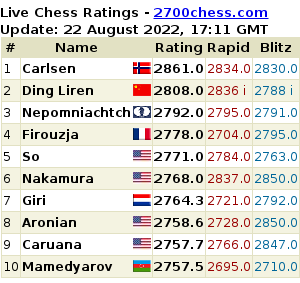 If the scores are even after the rapid games, then, after a new drawing of colors, a match of 2 games will be played with a time control of 5+3. If the winner won't be determined after "5 such matches (total 10 games), one sudden-death game will be played." The prize fund of the match will be at least 200,000 EUR. As the match will be held in the homecountry of one of the players Anna Ushenina will receive 5% of the prize fund after which the "remaining sum will further be divided as 60% for the winner and 40% to the loser if the FWWCM ends within the 10 regular games. In case the winner is decided by tie-break games, the winner will receive 55% and the loser 45%." The winner of the match will be entitled the World Champion. Let us remind you, Anna Ushenina of Ukraine is the reigning champion. 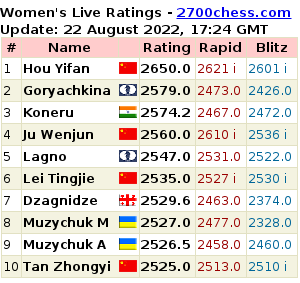 Hou Yifan of China obtained the right to challenge Ushenina by winning the previous Women's Grand Prix Series. The next World Women's Championship match, in which the reigning champion Hou Yifan should face the winner of the World Championship knock-out in Sochi, has been scheduled for October 11th-31st, 2015. Viacheslav Eingorn: "In Order Ushenina to Become a Real Champion She Should Just Win the Match Against Hou Yifan"
Viacheslav Eingorn, GM and coach from Odessa, shared his impressions on the recent World Championship with the TV-programme School of Champions. Game 4 of the world title match between Ushenina and Hou Yifan finished in a draw. Ukrainian again spent a lot of time in the opening, but after novelty 9...h5! ?, she undoubtedly came up with at the board, Chinese had to come out of her preparation. Nonetheless, Hou got a slightly better endgame (Ushenina had to take on f7 with a knight not with the king on 14th move) in which she failed to find the ways to strengtherning her advantage. Objectively it wasn't easy to find any.